As part of the newest version of the Generations line, Voyager class Soundwave was released with the gimmick of storing and ejecting data discs (an updated form of the old cassettes). These discs auto-transform into the minions that have classically accompanied Soundwave throughout the years. These data discs are simple and spring-loaded that transform with the press of a button. They have been released in two separate packs: Frenzy & Ratbat, and Rumble & Ravage. The fifth disc, trusty old Laserbeak, comes packed in with Soundwave. The sixth, Buzzsaw, likewise comes packed in with Soundblaster. The question remains, are the data disc two-packs worthy of your money as a standalone product? Rumble�s alternate mode is a data disc, just like all of Soundwave�s other minions. Finally Hasbro has made a decision on who is who between Frenzy and Rumble, the former designated as the red one, and the latter as the blue. There�s not much do describe here; it�s just a disc that�s about a half-inch high and about one and half inches in diameter. The plastic is dark blue, and the detailing has a digital look printed on top in light blue and silver, with a tiny Decepticon symbol in the middle. And that sums it up! To snap into robot mode, all you have to do is press a button on the bottom side of the disc. Rumble quickly snaps open when you release him, and he mostly auto-transforms into a little robot. It�s fun and quick, and he easily snaps back into disc mode. I haven�t noticed any transformation problems with him, and the switch seems rather smooth. The big downside with him is having to rotate his arms down and pull his feet out to get him fully transformed. It�s slightly disappointing, but I can�t even imagine the engineering that would have to go into such a small guy to make it all auto-transform. Even then the number of easily breakable spring-loaded parts would increase exponentially. I suppose it�s a good trade-off to have a sturdier product in the end. Rumble has a fair bit of molded detail on him, and there is a decent amount of black plastic thrown in to break up the blue. There�s a tiny Decepticon symbol on his chest, and he even has a painted silver face with a red visor. The hands are molded to fit tiny weapons like the ones that have come with the Prime series Legends class. And for articulation his shoulders swivel � and that sums it up! Being a spring-loaded guy limits the amount of articulation, but to me it isn�t that big of a deal on such a tiny guy. Rumble is easily the best one in this two-pack. Just like all the other discs, Ravage�s alternate mode is a data disc as well. Molded in black plastic, the disc has the same digital detailing like all the rest of the discs, albeit in black and silver. As usual, there�s a tiny �Con symbol in the middle. Nothing else to say here that wasn�t described with Rumble above. A simple press of a button and Ravage springs into � wait, he�s only half transformed. And his legs are stuck. Erm, hold on, just a twist here, swivel there� OK the hind legs are out, now the tail just needs flipped. Oh and the front legs need adjusting. Ah hah! Now there�s my Robotic Jaguar! Ravage is a mess. He doesn�t look much like a sleek Jaguar, more like a half-empty box on spindly legs. And the face looks more rat than Jaguar to me. There�s not much to say about detailing since he�s so atrocious, but he�s all black thanks to the black plastic with a small dabble of silver here and there. And a tiny �Con symbol on his shoulder. Other than that, Ravage is terrible. You might as well keep him stored in Soundwave�s chest and display Classics Ravage (that came with Hound) instead. Overall this two pack isn�t bad, but it isn�t as good as the Frenzy/Ratbat pack. Rumble is decent, but Ravage is absolutely horrible. 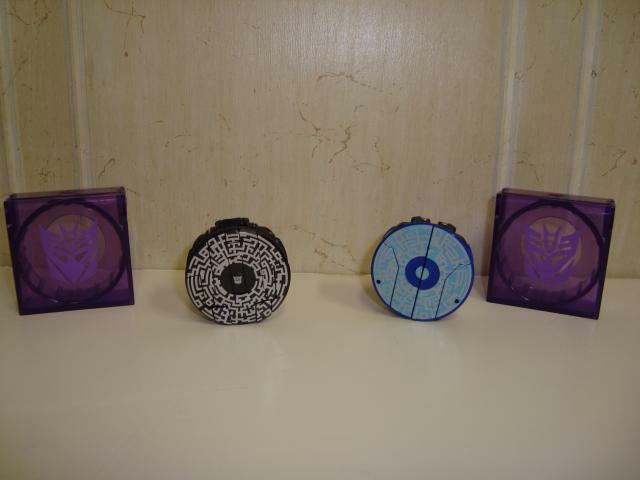 The discs do come with clear purple plastic cases with Decepticon symbols, so if you�re travelling, at least they won�t prematurely transform! Transformation Design: 5. They auto-transform (or are supposed to) but only partially. Both bots require hand movement of parts to get them into their other mode. Durability: 7. The plastic seems sturdy enough, but I fear the spring-loaded mechanism will die at some point. Fun: 7. Flipping them back and forth is great fun, but that�s about all they do. 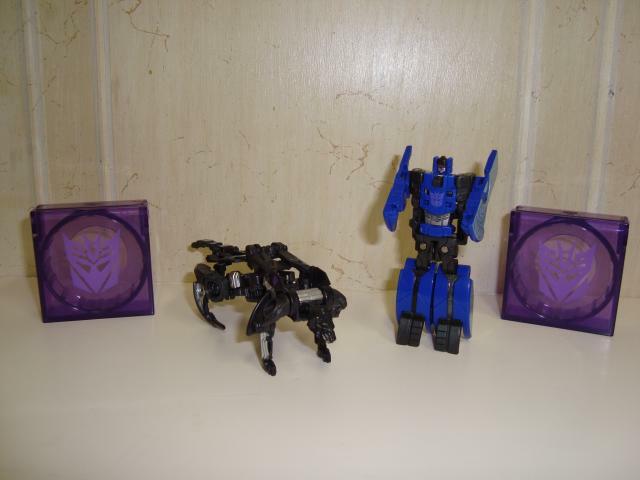 They look neat next to FoC Soundwave, but on their own, they don�t offer much. Aesthetics: 7. Rumble is OK, but Ravage looks like a boxy rat. Articulation: 3. There isn�t really any articulation to speak of. What is there really isn�t hindered, I suppose. Value/Price: 6. Two figures for ~$10 USD. Not a bad price, but there isn�t much to do with them. Overall: 5. Absolutely average. On their own, these two don�t do much at all, and one of them is terrible. If you pick them up with Soundwave and the other two pack, now you�re gaining a few points here. I really only recommend these two when you�re getting the whole set.